Short ish, but hopefully sweet (or at least informative, ha) this week…I just had to tell you about a concealer discovery which is far too good to ignore! I’m a foundation and concealer junkie (you probably know this! ), love trying new ones and am already a fan of the Too Faced Born This Way Foundation formula (read my review here), so the concealer version was always going to be on my radar! I’m going to get straight to it and say, bold statement maybe…but the new Too Faced Born This Way Naturally Radiant Concealer (Available from Debenhams*) is everything! I’ve got to admit, there are quite a few concealers out there that I love and are my ‘go to’ ‘ride or die’ etc, whatever you want to call them and I do like having concealers for all occasions and skin days. I do look for multi taskers that I could use anywhere, but generally go for a different formula under the eyes than on blemishes. Mainly for coverage but the finish too, I still like a good coverage under my eyes (thanks to my naturally dark under eye, ugh) and most of the time, the rest of my skin, apart from a bit of redness, is generally pretty good. Anything I use under my eyes though, I like to be radiant and smoothing, especially as I’m getting older, but I think anyone, whatever age/ skin type you are, will benefit from avoiding cakey, overly heavy concealer in the eye area! This concealer works just as well as part of a fuller coverage face, with lighter foundations and BB creams for every day or even on no makeup makeup days alone, for coverage just where you need it. The Too Faced BTW Concealer is available in 10 shades, is oil free and I’d say it gives a medium to full buildable coverage. I went for the shade light and it’s perfect for my NC15/20 skin tone. I don’t like to go too light in colour/ for the super highlighted look under my eyes, so if you do or are a similar skin tone to me, you might want to look at fair or even very fair instead. Light has a slightly more golden undertone to it too which works really well on any bits of redness. Similar to the BTW foundation, it’s infused with Alpine Rose which brightens and improves skins elasticity and also, for moisture without over hydrating, Hyaluronic Acid (which smooths too) and coconut water…which is also responsible for it’s fragrance, not overly scented (and not noticeable once it’s on) but it smells incredible! 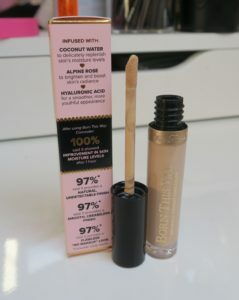 Too Faced say the coverage is undetectable, yeah, I’ll give them that, it does look really natural on the skin and gives a beautiful radiance. The only thing, possibly to consider if under eye concealer tends to crease on you generally, is you might want to set it with a little powder. I always set my under eye anyway, so this is a non issue for me, but if you don’t, maybe this won’t be for you. It wears for a good 8 hours and if set with powder, doesn’t make my mascara/ liner transfer which a lot of other hydrating concealers do! So yeah…the Too Faced BTW Concealer so far is a winner! Beautiful finish, feels good on, makes everything look brighter, all the good stuff! This isn’t a sponsored post, I did buy this myself and although I think this tube will last me ages yet, it is something I can see myself repurchasing. If you’re looking for a new concealer, this one is well worth trying, it’s also now available in the UK and Ireland (Available from Debenhams*) so check it out!